When Ashtin Berry began her college search, she knew two things: She wanted to live in a big city, and she wanted to dance. “I didn’t do the normal search for a college like most people did. I applied to schools based on where I wanted to live, and I wanted to live in a city,” she says. A native of Philadelphia and now a third-year student in the College, she applied to schools in New York, Washington, DC, and St. Louis, in addition to Chicago. She got accepted to a prestigious school in New York. “But something didn’t feel right. Something told me I should go to the University of Chicago,” she says. Berry joined a student group called Rhythmic Bodies in Motion and took their classes as well. She has performed with the Organization of Black Students and with the student University Theater, doing what she does best: a mixture of West African and hip-hop, and now some modern and jazz dance. She also directs University Theater’s outreach to the public schools, helping student artists make contact with local public schools that are looking for training and arts exposure for their young pupils. 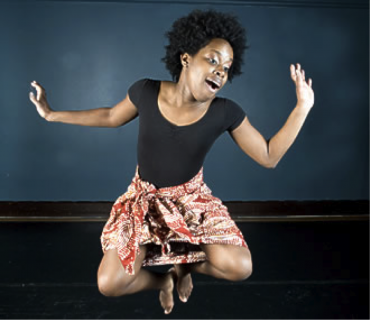 When she has time, Berry takes additional classes at the Lou Conte Dance Studio or Muntu Dance Theatre of Chicago. “I want to pursue a master of fine arts degree right after college and then go into marketing and advertising. Eventually I’d like to go into business for myself,” she says. Whichever path she chooses, the arts will be a part of life. And wherever she lands, she knows two things: She wants to live in a big city, and she wants to dance.